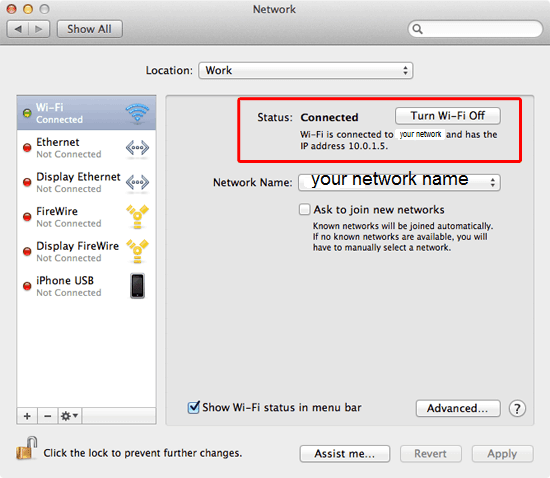 There might be different reasons for which you may need to know the IP address of your Mac. Basically, the IP address is the online location of your computer or digital device. It is a unique address, which the Networking hardware needs to know, in order to connect you to the Internet, to identify you and to route digital information to your computer. To put it simply, the IP of your Mac operates just like a physical mail address, which can route to your home. In most of the cases, your IP address is detected automatically. That’s why most of the users don’t need to know it by heart and don’t need to use it every time. In certain situations, however, you may need it and, that’s why, in the next lines, we are going to show you how to find it. There are two types of IP address – Internal and External. The Internal one is known as private, or the so-called local. This address applies to a single device and is only used within your local network. It is not disclosed in public and normally looks something like 192.168.*. *, where the * numbers may vary. The External IP address is known as a public one and the Internet is using it to contact and locate your computer. It usually appears either as 8 to 12 digits, separated by dots after each forth digit (IPv4) or as around 30 digits, separated by dots after every eight digit (IPv6). Usually, if someone asks for your IP address, they probably refer to the external one, but whether you are looking for the internal or the external, here we are going to show you how to find both of them. The search results will most probably show you a number of websites like What’s My IP Address. Open the site of your choice and your external IP address should be displayed on the page. Navigate to the Apple menu at the top corner of your screen and open System Preferences. Then, click on the Network icon. A window will open where you will see on the left side a couple of selectable options like Ethernet, Wi-Fi, Bluetooth, etc. The green-dotted ones have IP addresses assigned to them. Select the one, which is on top and then check the information that is written on the right side of the window. There, you should see a sentence stating something like “Wi-Fi is connected to (the name of your network) and has the IP address 192.167.1.106” for example. That number at the end of the sentence is the internal IP of your Mac.